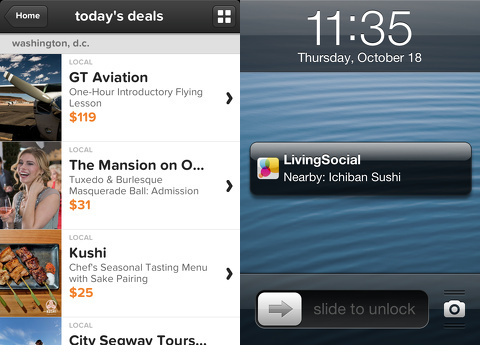 LivingSocial is a coupon app by Hungry Machine Inc. Livingsocial.com has providing cheap ways for people to enjoy getaways, restaurants, and various activities for years, boasting offers as high as 90% off of the regularly marked prices. Their app for iPhone, iPad, and iTouch now conveniently brings their great deals to iOS devices. 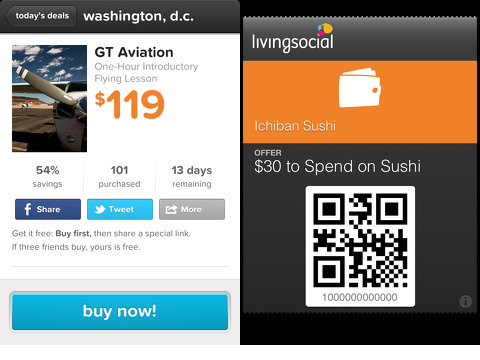 LivingSocial allows signing up as a new member or logging in with a Facebook account. Once everything is all set up deals will automatically be sent to your device daily. The app sends notifications of deals in your area, allowing users to also choose to receive offers from neighboring areas as well. You can also search for nearby deals and offers at local restaurants. There is an ‘escapes’ category for discounted deals on various vacation getaways. These deals can include packages to spas, resorts, and theme parks in all sorts of locations ranging from beaches to cities. As the name might suggest the majority of the escapes seem to tend to lean towards more tropical locations. You can e-mail or tweet your deals to friends to see if they want to join in on the fun. Not only could that help get a little posse going on your adventure, but if three friends sign up you get your deal for free. All your deals are saved and easily retrieved from the ‘my vouchers’ list. This way you can lighten your load (and save some trees) by no longer needing to print out coupons and vouchers since they are all saved to your device. You merely show your device to the vendor and you’ll be on your way in no time. LivingSocial is a useful free way to find cool things to do, but be warned: If you are the type of person who can’t turn down a good deal then LivingSocial could be a potentially dangerous resource for you. Most of the deals presented are undeniably great values, whether or not you end up taking advantage of them is the real question. You’re a respectable, busy person, I’m sure. Don’t forget to stop and ask yourself whether you have the time, energy, and actual interest to do the things you are about to get a great deal on. Are you really going to go to three acupuncture sessions? Might there be a reason you’ve never gone fly fishing? Had you even heard of butter sculpting before today? No matter how little you spend, a great deal on something you never end up using is still a rip off. AppSafari review of LivingSocial was written by Neema Akhtar on November 12th, 2012 and categorized under App Store, Local, Shopping, Travel. Page viewed 4146 times, 1 so far today. Need help on using these apps? Please read the Help Page.